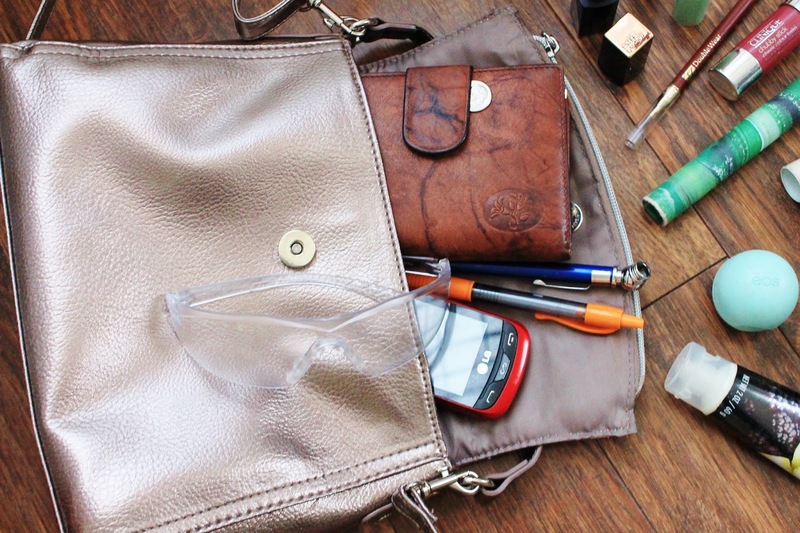 A Vapor in the Wind: What's in My Purse? My Purse - I really have no idea where this purse came from aside from the fact that I got it at Wal-Mart on clearance for approximately $5 and it was made in China. I like the silvery champagne color as well as the size of this purse. It's not too big and bulky but it's large enough to still be practical. Stupid Phone - I have had this "stupid phone" for a couple years now and it has served me well! Its battery life is kind of lame--my old stupid phone could go for two weeks before it needed to be charged (beat that Apple!) --my current stupid phone only lasts a couple of days (sigh) before I have to charge it. It will probably be replaced sooner or later with an iPhone but I'm not in a hurry to join the world of smartphones. Safety Glasses - Because work. When writing this post, I couldn't help but think what a perfect reflection of my personality this is. I am a total princess with a strong streak of tomboy. Buxton Heiress Double-Cardex Floral LeatherWallet in Mahogany - This wallet was a gift and right now I am blanking on who gave it to me, which is terrible! I know I received it a couple years ago but only recently started using it. I believe one of my older sisters gave it to me, so maybe they can refresh my memory. Whatever the case, it has served its purpose well! Not only is it stylish, but it has ample space for cards, cash, and change. Jade Matcha Cologne Rollerball from Thymes - I discovered this lovely cologne (last year?) in a little boutique shop while spending an evening out in the downtown city with a dear friend. I believe it was on sale for $10 and it's been my go-to scent for special occasions ever since. 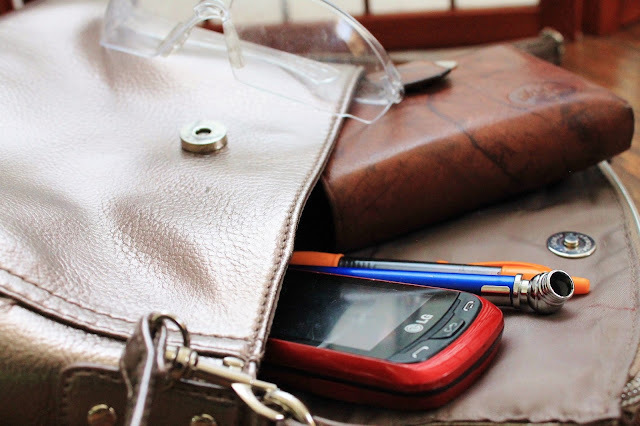 I typically don't wear it on a regular basis, but it's nice to have handy in my purse for the times when I do need it. Double Wear Stay-in-Place Lip Pencil in Brick by Estée Lauder - This is one of the most expensive make-up items I have purchased at full retail price. I bought it last winter for my sister's wedding to go with the lipstick featured below. I typically only use this pencil on special occasions but like to keep it handy in my purse. Falsise Push-Up Drama Mascara (Waterproof) from Maybelline - I purchased this mascara for my sister's wedding last winter because I thought waterproof mascara would be helpful for an exceptionally emotional day. 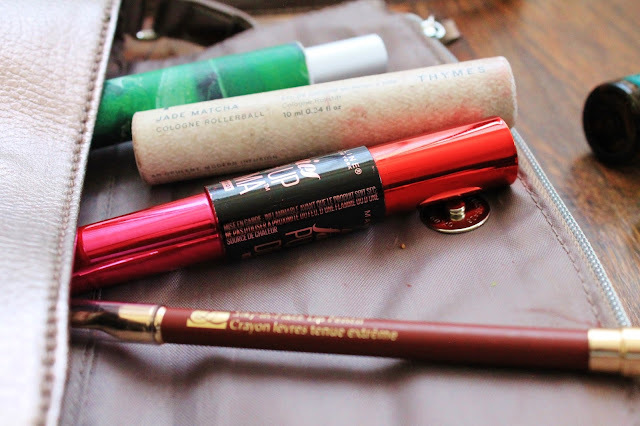 Since then, I haven't really used it and keep it in my purse mostly as a back-up, because you never know when you are going to need a touch-up of mascara or waterproof mascara. This mascara's application is a little too clumpy for my taste and it is terribly difficult to wash off so I have to be really careful and very sparing when applying it. I use Clinique's high impact mascara on a regular basis. Blackberry-Vanilla Moisturizing Body Cream from bodycology - Unfortunately I don't think this fragrance is currently available from bodycology, which is too bad because I absolutely love this fragrance. I use this as my go-to hand lotion everyday even though technically it's a body cream and not a hand lotion, tomato, tomato, if you know what I mean. I believe this was a gift from one of my sisters as well. Sweet Mint Lip Balm from Eos - Because lip balm is a must and I am kind of crazy about peppermint. Excuse the lipstick stains. I think some lip-liner accidentally escaped in my purse. White Peach Chardonnay Antibacterial Hand Gel from Bath & Bodyworks - Hand-sanitizer is a must because there are always going to be those situations when you need to use it. I received this hand-sanitizer in my Christmas stocking last year. Unfortunately I don't think this fragrance is currently available at Bath and Bodyworks, which is sad because I love it. It comes in handy on Sunday mornings before my Sunday school students want to eat their snacks or during road trips when we are eating on the road in the car. Peppermint Essential Oil from Young Living Essential Oils - This was a gift from my mother. I don't buy a lot of essential oils and when I do I simply purchase them through my mom, but peppermint and lavender essential oils are two I use frequently as well as the Purification and Thieves oil blends from Young Living. Peppermint is my go-to for headaches and when I am feeling tired. I don't get headaches very frequently at all. I typically only get them when I am dehydrated or extremely tired, but it is still nice to have this handy when I need it or when anyone else might need it. All Heart Long Last Lipstick from Clinique - This lipstick was a gift from my sister Anna for Christmas. It came with a sampler of Clinique's high impact mascara, which is now my favorite everyday mascara. 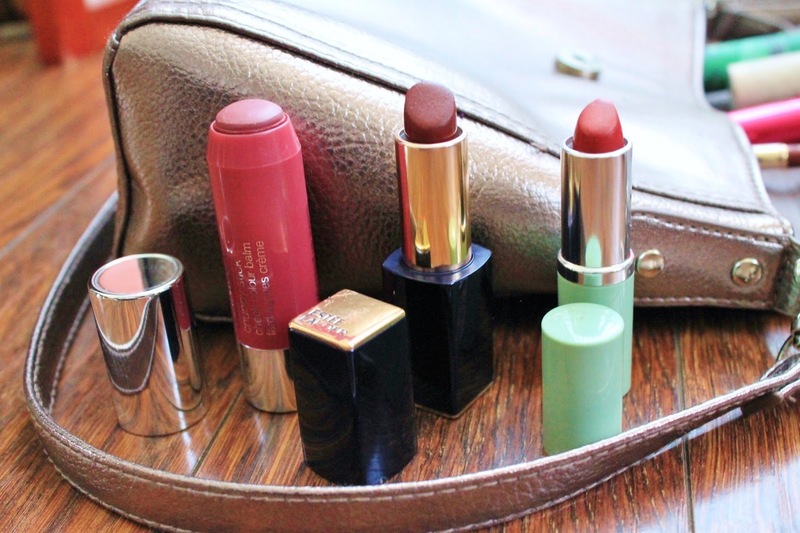 I use this lipstick on a regular basis, hence why I keep it in my purse. It is the perfect combination of bright, shimmering, and subtle color for my taste! I foresee myself using it even more as the spring and summer progresses. Also, I love how long this lipstick lasts without feeling as though it is weighing down or drying out my lips. Plumped Up Peony Chubby Stick Cheek Colour Balm from Clinique - I received this cheek colour balm from a friend a few months ago. I don't use this on a regular basis, but keep it in my purse as more of a back-up. It never hurts to have a back-up. I am not a big fan of the application of this balm since it is really difficult to blend, but I really love the color and just have to be careful to apply lightly when I use it. DECADENT Pure Color Envy Lipstick from Estée Lauder - This is probably the most expensive make-up product I have ever purchased at full retail price. I got it for my sister's wedding as I wanted a lipstick that was a dark, neutral color and long-lasting. I have never, ever been satisfied with drugstore lipsticks. They never last long enough and the application always dries out and weighs down my lips. 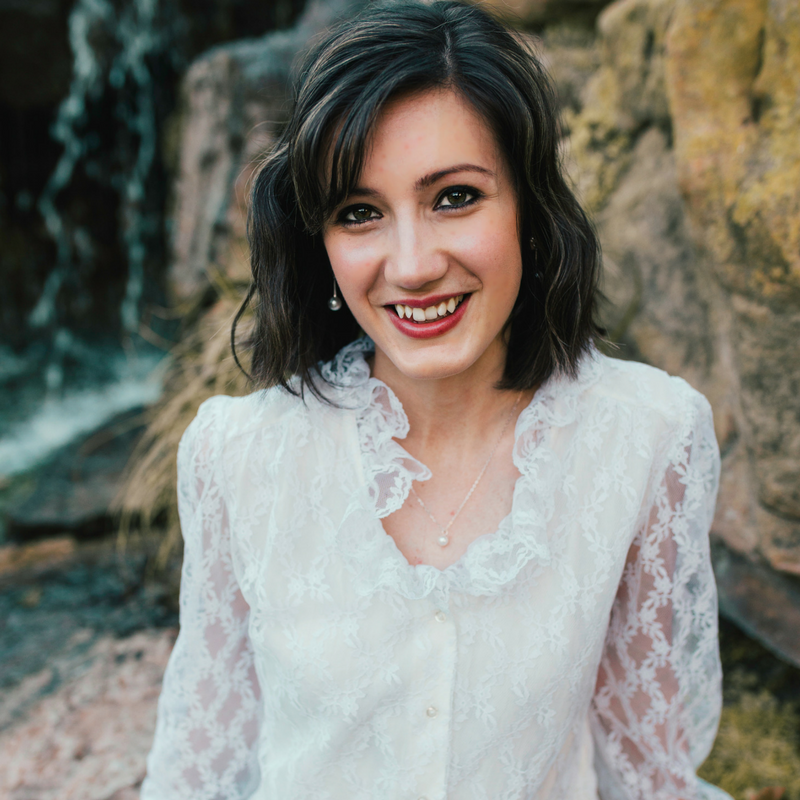 Not only was this lipstick long-lasting (it lasted through photos in the morning, the wedding ceremony and reception in the afternoon, AND a winter ball in the evening and late into the night) but the application was fantastic. It hardly feels like anything is on your lips at all! And there you have it! I want to give an enormous thank-you to my sister Anna who took all of the beautiful photos above. Also, thank you to my nephew Banjo for refraining from demolishing all of my lipstick and for being so patient while Mama took pictures! 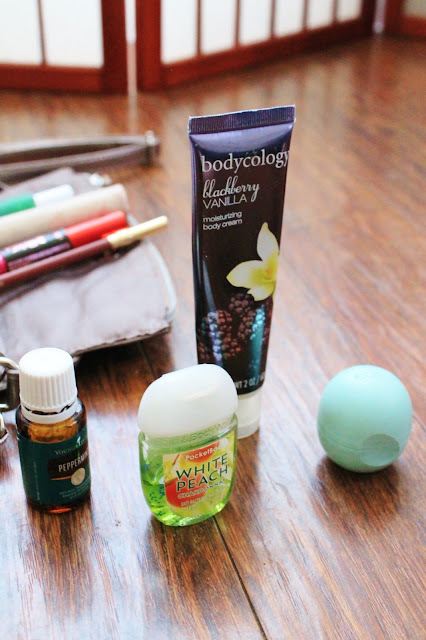 These are all the staples I keep in my purse on a regular basis. 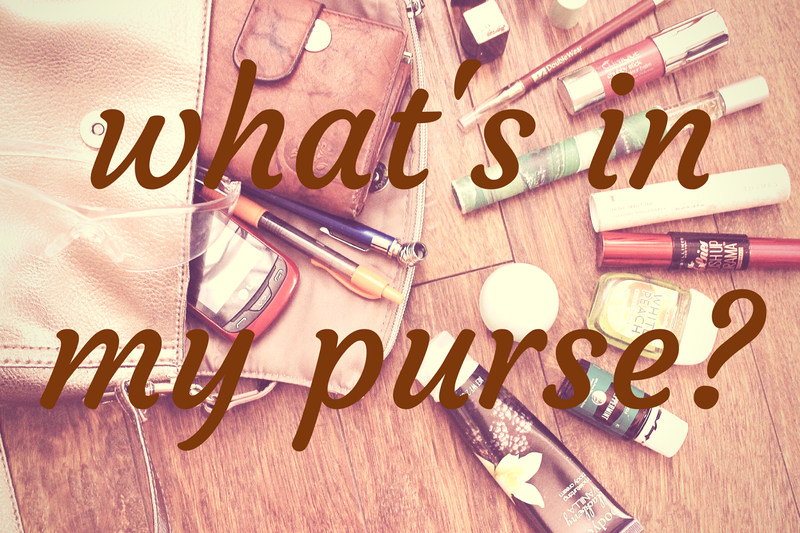 What do you keep in your purse? I would love to hear from you, so leave a comment or email me at jehovahreigns@gmail.com. Also, go and like my Facebook page if you haven't already! This post was shared on Bernideen's blog party! 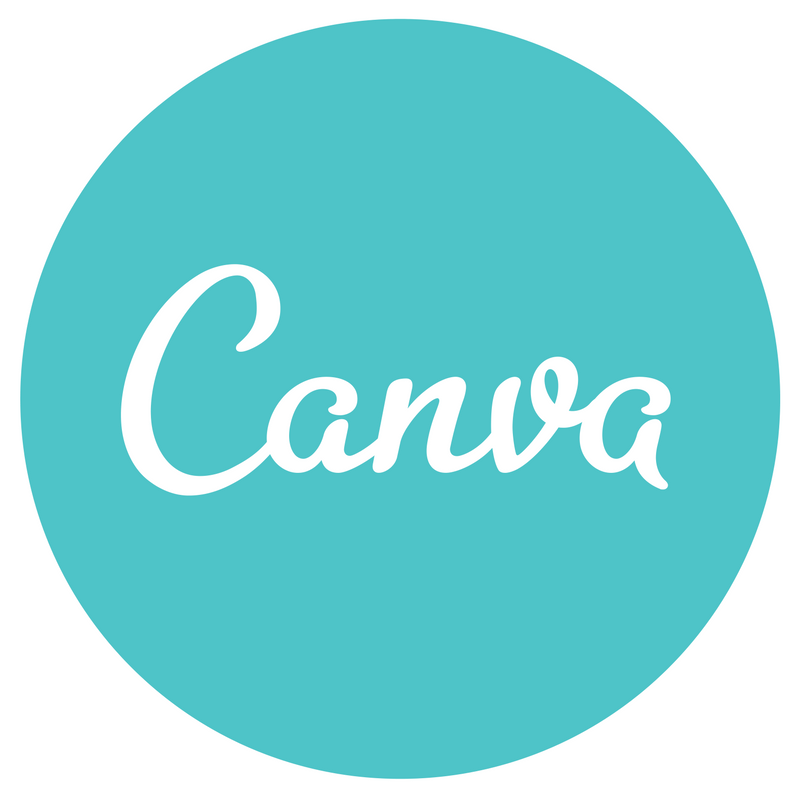 I stumbled across your website and love it. Thank you. 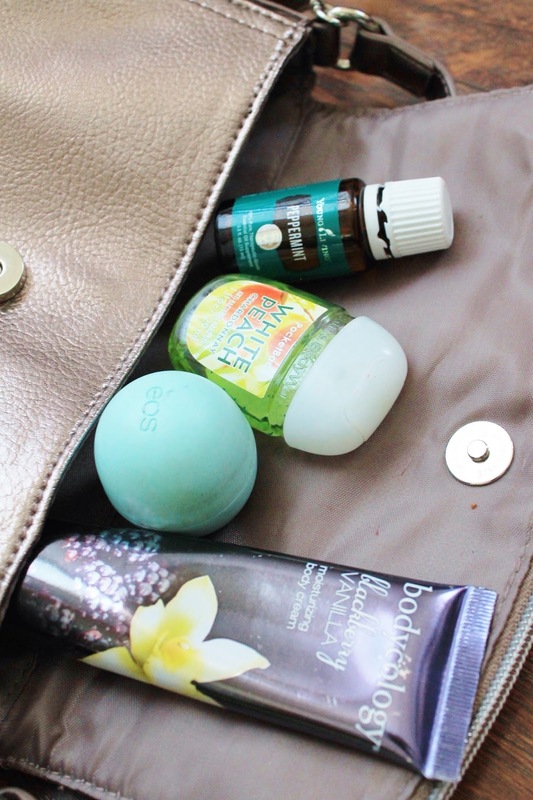 Fun to see all the beauty products and such you keep in your purse! Your wallet is pretty and the lip colors are fun! It's funny that you mentioned your phone battery; I recently upgraded from a flip phone that charged maybe every week to a simple chocolate-bar style phone that needs charging every couple days, if I'm careful! ey there lovely lady! I have missed visiting you and your blog...how are you? 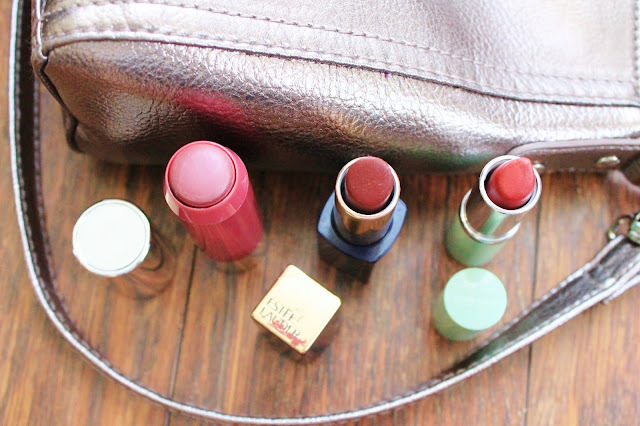 It was quite fun to get a peek into your purse :) LOVE those lip colors! Thinking of you and wishing you a wonderful week. Hugs! Hi Stephanie! I'm doing very well. Thanks so much for stopping by! Hope you have a grand week as well! I do love organization. Thanks for sharing these helpful tips on how to get there. You have lots of clever ideas and inspiration. 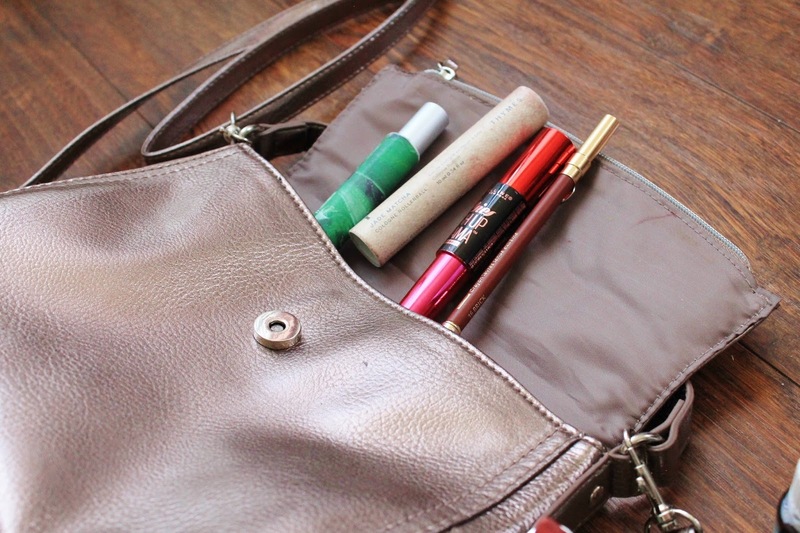 Now everyone can organize their purses! Thanks for sharing and linking. Random observations: First, can you truly be prepared if you identify an air pressure gauge as a fuel gauge. Leave it. It's honesty in your expression. Second, as a reflection on your list, you are definitely a child of the times. Beyond "stupid phone" "safety glasses" and "fuel gauge" (smirk) your list identifies products, not simply function. This is observational, only; but in contrast to the amazing coincidence only a couple of people would recognize. Your great-grandmother Dalluge. Clessie. She had a purse. It was large, soft, and the woman once won a church picnic contest for "most things in a purse" with over 80 items. I doubt she knew a brand name; but if a grandchild needed anything, she could find it in that bag. I never saw organization, but the woman was prepared. This is not a commentary on your life and choices. You know I appreciate you and your creativity. It's a reflection on my sense of seeing a crossroads moment, where my past and future intersect and I see myself aware of life's swift passage, laid out in cosmetic and sundry items, and women I admire. Well stated.